The NEW Atomic Aquatics BC1 is designed to be the TOUGHEST performance BC in the world. The BC1 redefines traditional BC design. Every detail was reexamined. Every material and component was rethought. 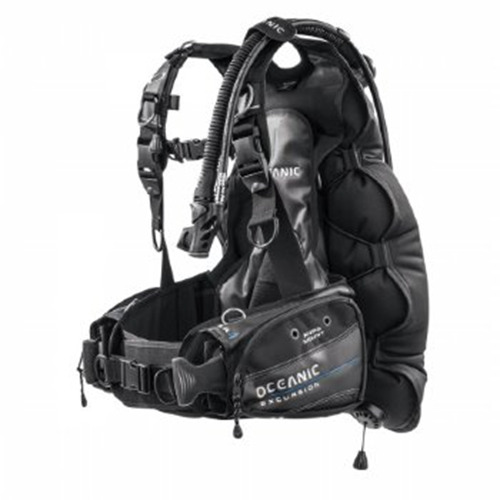 The new Atomic BC1 is designed for the diver who wants the absolute BEST available. The Atomic BC1 was created using exclusive engineering-grade plastics, polyurethane coated textiles, and corrosion-resistant metals. 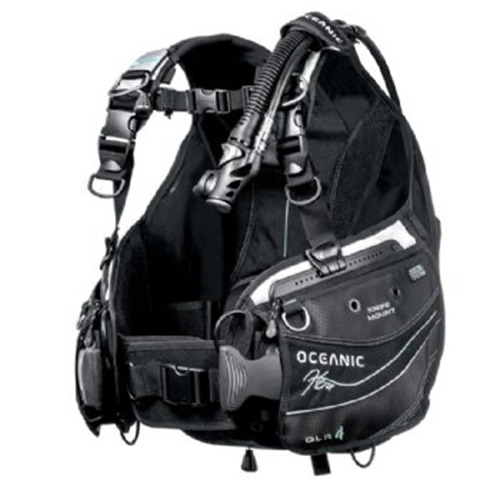 It is designed to go toe-to-toe with the ocean environment. It's the toughest BC in the world. Atomics' custom matte-finish fabric has a different look & feel, making this new fabric unlike any other. Not only does it Look tough, it's built and designed to hold up year after year. Strong double-laminated polyurethane textile material is designed to hold more pressure. This material will handle cycle and burst pressures to failure nearly double that of standard BC materials. A watershed moment in BC design. Really The Atomic BC1 sheds water like a raincoat. Water does not penetrate the fabric with polyurethane coating on both sides. The exterior coating is thicker to prevent tearing, cutting or leaking. But, the big benefit the BC is virtually dry right after your dive. You will be amazed how easy this is to use, and how securely it holds your tank in place. The concept is like the bindings on ski boots. The ratcheting band quickly adjusts to accommodate a variety of tank sizes and the over-center buckle locks everything tightly in place. Gone are the days of trying to figure out how to weave nylon webbing into a buckle. Just push the molded belt teeth past the ratchet and lock it down with minimal effort. It's quick and easy to load your weights in or out of the water. Two zippered weight pouches hold up to 4.5 kg each of hard or soft weights in sizes Small to Large and 6.35 kg each in X-Large. 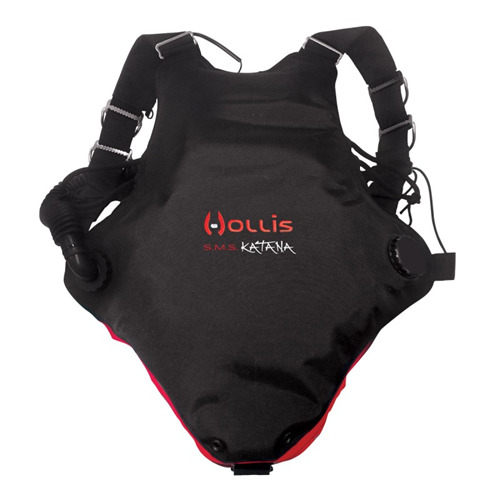 The weight pouches glide into the weight pockets under the arms and lock into place with a reassuring Snap." A simple one-handed tug on the handle is all that is needed to release. It's the same principle that has been used for years on Atomics EZ-LOK fin straps. 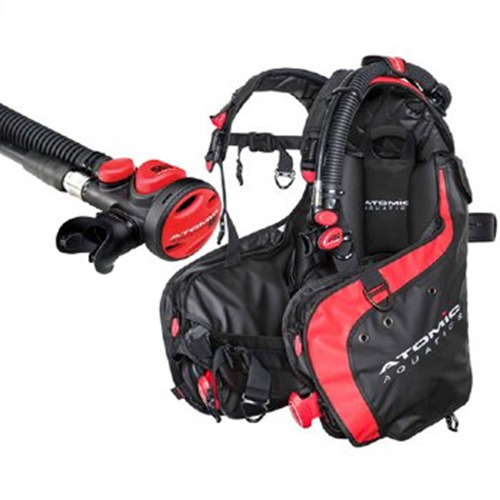 BCD also has rear non-releasable weight pockets that can hold from 2.7 kg to 4.5 kg depending on the BCD size. The Atomic BC1 is designed to be exclusive even the manufacturing involves a custom hand-crafted sewing process and custom binding tape. An insert-molded polyester reinforced belt in the tank band ensures safety. 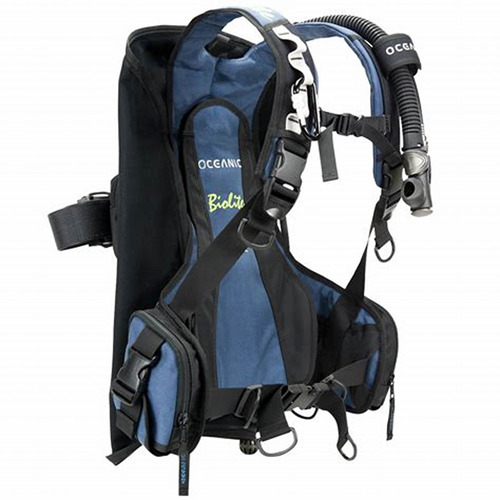 Other great features of the BCD are: Custom 316 stainless steel D-rings with titanium PVD coating for accessory attachment, diamond pattern quilted back pad & adjustable lumbar pad. There is a non-skid tank pad w/CNC machined stainless steel hardware molded to the frame & sand-resistant zippers on the two side pockets for additional storage of accessory items. The BCD provides the following lift capacities. SM provides 14 kg, MD provides 14.5 kg, ML provides 16.33 kg, LG 17.7 kg and X-LG 21.8 kg. 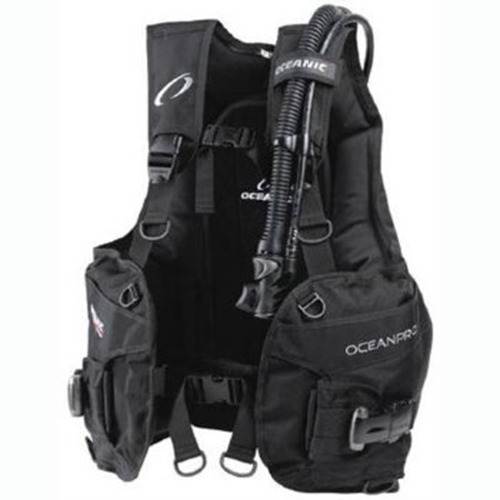 Adjusting the BCD is achieved with torso, sternum & waist adjustable straps. All straps come equipped w/squeeze-style side release buckles for easy donning/doffing. The buckles are made from durable impact resistant plastic for strength & durability. Adjustable cummerbund for added comfort & security. Size SM to LG; Pouches Hold Up to 14.5 kg. Available in Small, Medium, Medium/Large, Large, eXtra-Large. Height 5'2" - 5'7" 5'-7" - 5'10" 5'10" - 6'0" 6'0" - 6'2" 6'2" - 6'5"
Waist 27" - 42" 30" - 45" 31" - 47" 35" - 50" 37" - 52"